↑ 2.0 2.1 "Senators give new flag green light". The Lesotho Government Portal. สืบค้นเมื่อ 2006-10-05. 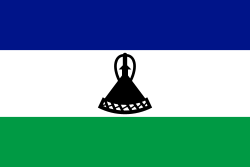 ↑ 3.0 3.1 "New National Flag Passed by Parliament", Summary of Events in Lesotho, 3rd Quarter 2006, trc.org.ls. หน้านี้แก้ไขล่าสุดเมื่อวันที่ 9 มีนาคม 2556 เวลา 13:26 น.